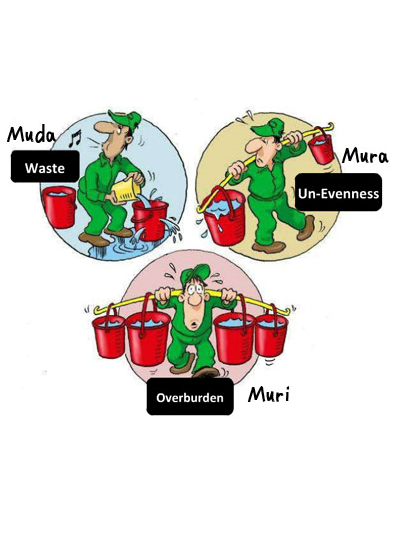 Toyota has developed its production system around eliminating three enemies of Lean: Muda (waste), Muri (overburden) and Mura (unevenness) (Liker, 2004). Muda is the direct obstacle of flow. As written below, there are 8 distinctive types of muda which all lead to waiting times, and therefore longer lead times in a process. Simply taking out the muda does not work. Usually, there is a reason why the muda is there and this reason often has to do with the other two enemies: muri and mura. This means the three enemies of Lean are interrelated and should therefore be taken into account simultaneously. The three enemies of lean can be found in both production and office processes. I even dare to say that they can be found more in office processes than in production processes. One reason for this is that production processes are visible. Everybody who walks through a factory can see the inventory waiting to be worked on. In the office environment however, processes are often hidden inside our computers, in mailboxes and IT-systems. Though it is the goal of lean to reduce all three enemies of Lean, it might not be possible to completely remove all of them (Panneman, 2017). In terms of muda, unless your factory is placed next to your customer, there will always be some sort of transport necessary to get the product to your customer. We should focus on reducing the transport time and costs as much as we can, but 100% reduction is not realistic. The same holds for muri. There can always be a time where machines or people have to give that little extra effort or time to make sure the customer demand is fulfilled. There is nothing wrong with this when you can thereby get a huge order of extra products or win over a new client. The problem exists when you are expecting this from your machines or people all the time, up to a point where a machine will burn down or a colleague burns out. Finally, even mura cannot always be reduced with 100%. When you are producing different products, they are bound to require different materials, a different way of working or even different process times. This is even more so in project work, where every project is different, or in the financial world, where a financial report needs to be delivered at the end of each month. MUDA, waste, can be defined in eight types, 7 defined by Toyota and ‘non utilized skills’. These are: Defects, Overproduction, Waiting, Non-used Talent, Transport, Inventories, Motion and Excess processing. As Mnemonic device, the first letters of these wastes form the acronym DOWNTIME. There are numerous tools available to identify and remove waste from your process, which include Poke Yoke, Kanban, Takt Time, SMED and One-Piece flow (Panneman, 2017). In the article Finding Muda (waste) in your process each of the types of waste are described and linked to tools which can be used to eliminate them systematically. MURI, overburden, can result from Mura, and from removing too much Muda (waste) from the process. When operators or machines are utilized for more than 100% to finish their task, they are overburdened. This means breakdowns when it comes to machines and absenteeism when it comes to employees. To optimize the use of machines and make sure they function properly, preventative- and autonomous maintenance can be implemented. To prevent overworked employees, safety should be the focus of all process designs and all standard work initiatives. For more information about Muri, go directly to the article: Finding Muri (overburden) in your process. MURA, unevenness, can be found in fluctuation in customer demand, process times per product or variation of cycle times for different operators. In production environments with low-volume, high product variation, flexibility is more important than in high-volume, low-product variation environments. When Mura is not reduced, one increases the possibility for Muri and therefore Muda. Mura can be reduced by creating openness in the supply chain, change productdesign and create standard work for all operators. These are described in the article: Finding Mura (variation) in your process.